For more than thirty years, Tabletalk has existed as a magazine for laymen. Generally speaking, laymen receive either very little instruction in the weightier matters of the faith, or the instruction is too academic, thereby making the material largely inaccessible to average laymen. This is the reason Tabletalkexists—to bridge the gap between these two poles, to explain to the people of God important, biblical doctrines and events while admonishing them toward holy living. For this reason, we will continue to focus on significant issues of the Christian faith, like, for example, how the modern Reformed church is reaching the lost with the hope of the Gospel of Christ Jesus. 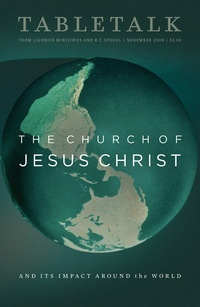 This is the theme of the November 2008 issue of Tabletalk, which intends to give its readers a basic update and understanding of the issues surrounding doing Reformed missions around the world. Contributors include R.C. Sproul along with Bill Green, Peter Hammond, J. Nelson Jennings, Douglas F. Kelly, Keith A. Mathison, John Piper, R.C. Sproul Jr., Joni Eareckson Tada, and Gene Edward Veith. Tabletalk features articles about topics central to the Christian faith and daily, in-depth Bible studies. The 2008 Bible studies examines the gospel of Matthew and the Redeemer who saves His people from their sins.